There’s no need to go and purchase flowers at the supermarket. Make your garden your florist shop. Invest in beautiful flowering trees and bushes that will give you years of botanical enjoyment. I planted 2 forsythia bushes 2 years ago and they have taken over! I’m an instant gratification kind of girl, and these satisfy that need! 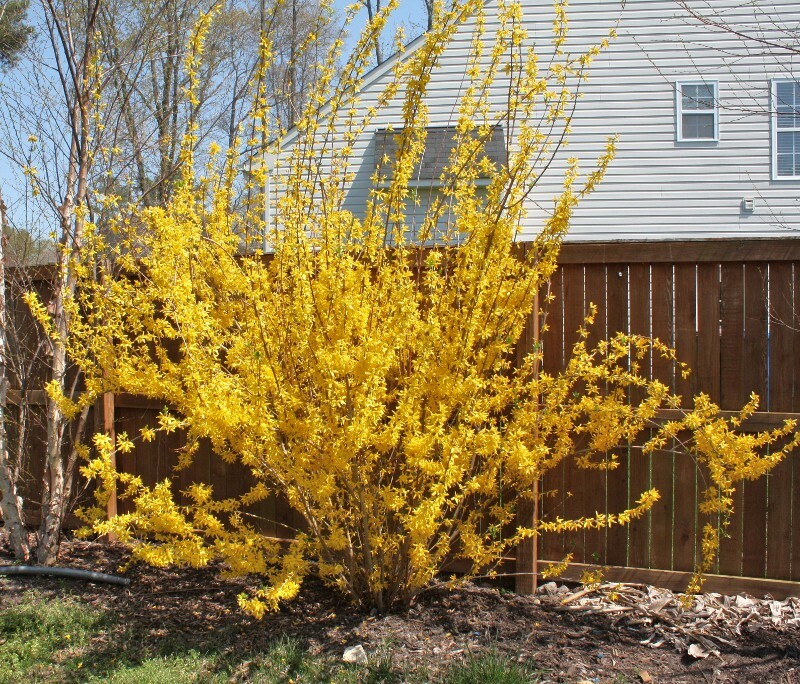 Forsythia grows so fast and you need to keep it trimmed so it won’t grow crazy wild in your yard. What is wonderful about this plant is that you can cut the branches as the buds begin to swell and “force” them to bloom inside. I cut several stragglers off my bushes and placed them in a large glass vase that stands about 3 feet high. It was an amazing find from Home Goods. I love my Home Goods! Oooo, yes, it’ll be awesome… keep reading! Ok, yes…. I love my wine. Bring me a bottle of wine and you just scored mega brownie points with me. I’m kind of sad to see the death of the actual cork now a days. Have you noticed that? It’s been replaced by a synthetic, plasticy- material. Is plasticy a word? I understand it is technically better for wine preservation but come on… hasn’t thousands of years of actual cork and wine sufficed? Must we introduce more petroleum into the mix? This is what two years of growth can produce. Forsythia grows crazy fast and needs to be tamed. I’ll be cutting it back after I enjoy the blooms. Cut the branches when they start looking like this picture below, buds swelling and just about to bloom. Douse them in a vase of water, keep them in bright yet indirect light and wait for the magic to happen. You can make several small arrangements or a massive, large arrangement. They will last for at least a week, which is wonderful! 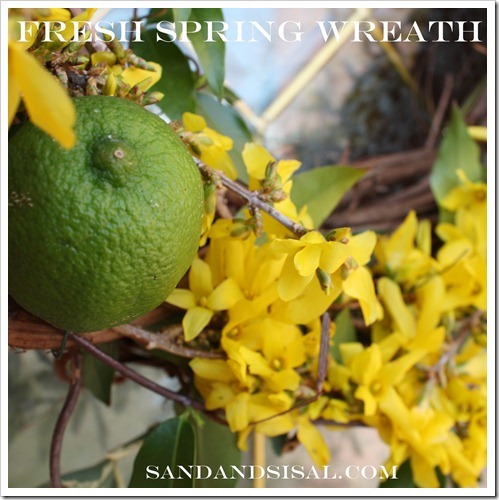 Bright springy color in your home is bound to cheer anyone up! I’m obviously a forsythia fan. 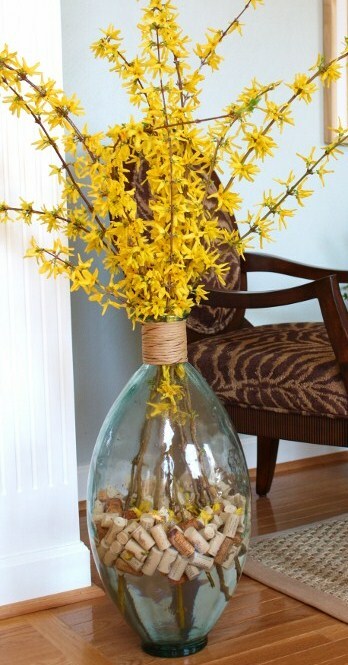 Check out these posts on how to use forsythia in other ways. 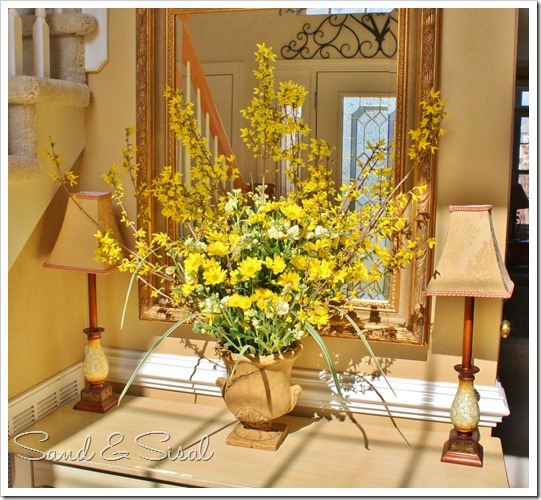 So glad you shared this as I cut some of our forsythia about a week ago and they are blooming beautifully now in my vase on our mantel. It helps brighten things up in Michigan as our spring is really struggling to get going! Enjoy!!! Angela, forsythia would grow fine in Texas. You just have to be careful to not let them get overgrown. They could bloom as early as late February there – depending on the winter weather. That vase is amazing! Love the idea of the floating corks. Hmmm.. must check if it will grow in North Central Florida. Very pretty. I am also a pinot fan!!! YUM..
W are out, been avoiding shopping… just not int eh mood to go to the grocery store 🙂 So the meal tonight, fettuccine alfredo was quite lacking in a good pinot grigio to accompany it’s saucy goodness. 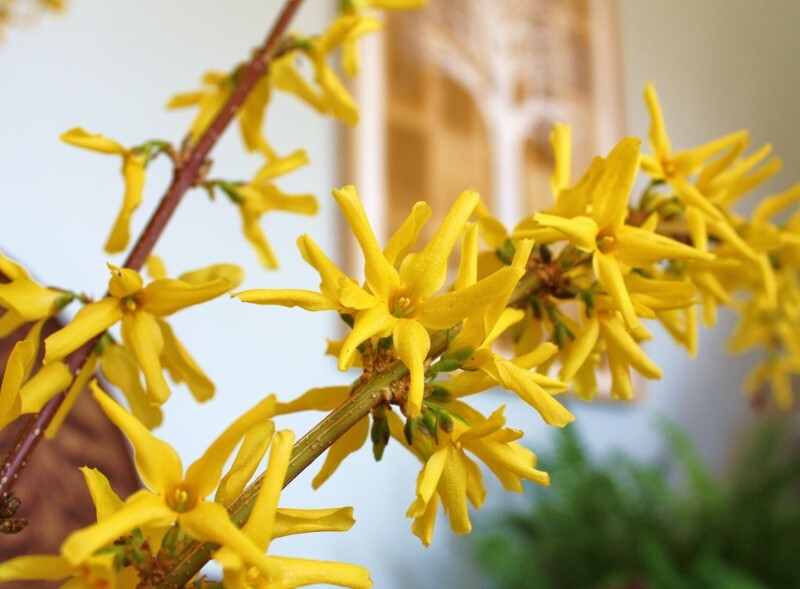 Thanks for sharing the info re forsythia. Like what I see . I love your arrangement, Kim! Thanks for all your tips, I like the corks! And I love Pinot Grigio, so light and refreshing in the summer. 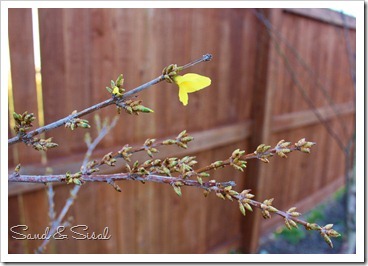 I have a huge forsythia and since it’s in a corner of my yard, I just let it grow wild. It’s not budding yet but soon I’ll have stems everywhere in my house. When my grandaughter was two, forsythia was her favorite word. 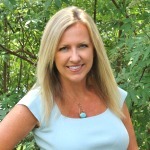 In the spring she would verbally identify every plant she saw and in middle Tennessee she saw many of them! 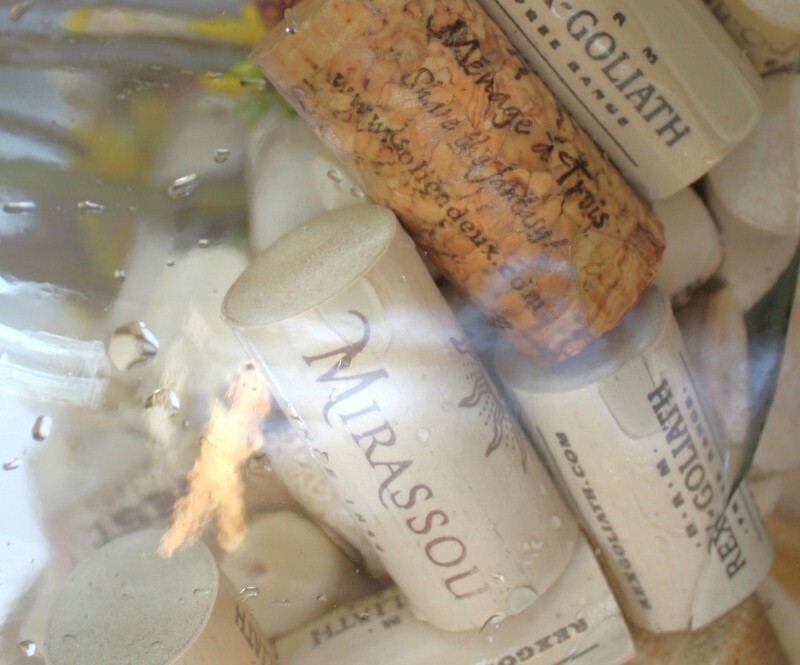 Wow, we have a dozen of these in our backyard – and Lord knows I have enough corks! I just might have to take this project on to bring some color into the house. Spring has been SO late coming to New York! We don’t have buds yet here in Chicago. Although I did see my first daffodil poking its head up today! We have rainy weather in the 40’s for the next couple days. Spring is taking its sweet time showing up!